Truecaller is an identification solution application company aimed at ensuring safety of mobile users. A Truecaller Insights Special Report listed the top most spammed countries in the world. 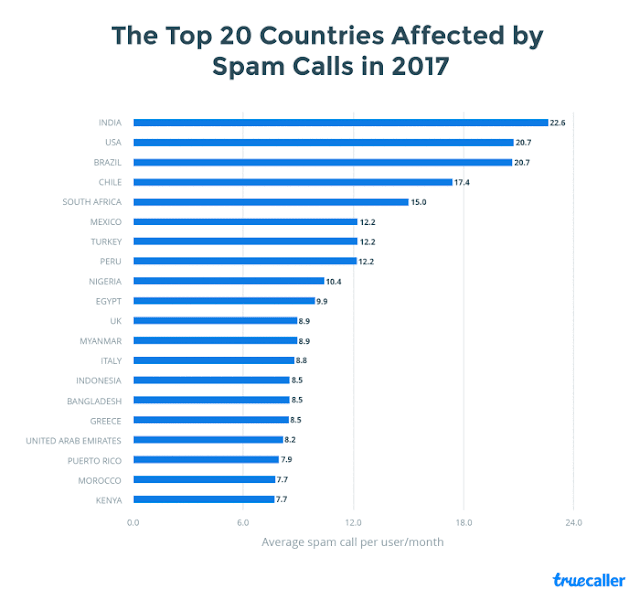 The Marketing Manager, Truecaller, Ms Lindsey Lamont, said that top 20 countries affected by spam calls were India, with 22.6 per cent; USA and Brazil, with 20.7 per cent each; Chile, 17.4 per cent; and South Africa, with 15 per cent. Nigeria got 10.4 per cent & and Kenya got 7.7 per cent. Our research on the United States is especially interesting to watch. Now, only two months after our latest Truecaller Insights Special Report, we see that spam calls in the U.S. have risen by yet another 20% (from 18.8 spam calls), making the United States second in line to be the world’s most spam-call plagued country. In the U.S., our research tells us that spam calls are dominated by nuisance and scam calls. Financial services and debt collectors is also a big category that is spamming our users. This is an interesting observation, as in American culture credit cards and acquiring and paying off student loans are quite frequently adapted. With operators being the top spammers (33%) in Brazil, usually these calls are seeking to provide special offers for free data, or unlimited calls. The second biggest spammers in Brazil are debt collectors who make up (24%) of the top spammers in the country – sometimes these calls can be fraudsters pretending to collect money for illegitimate reasons. Another major spam call problem that the Brazilian have to deal with is nuisance calls (21%.) These are more general types of calls that are unwanted and unsolicited that are a disturbance for users, or at the very least, amount to prank calls and at worst, harassment and fake kidnap calls. A big problem around nuisance calls in Brazil are calls from various companies making telemarketing and promotional calls, which amount to (12%) of the total for reported spam calls. Chile’s spam call issue is mostly with financial services trying to sell new loans, which is ironic, knowing that their 2 largest spam call issue is with debt collectors. Kenya was a different case than our other research. Scam calls made up 91% of the reported spam calls. We classify this because the calls were from people’s names instead of businesses. Similar to its regional partner, Kenya, the country of Nigeria also has an issue with spam calls (27%), but is plagued more by calls from operators. South Africa seems to have more of an even spread when it comes to who is spamming. With telemarketing (39%) leading the way, financial (24%) and insurance (13%) are the most known types of spam calls. Unlike Kenya and Nigeria, this African country only has 1% of its calls marked as scam. Similar to South Africa, the United Kingdom has a more variety of spam call categories. With telemarketing leading the way at 31%, it is insurance calls, such as PPI, that is close behind at 23%. The most common complaints we see from our users through social media and interaction, is about PPI calls, so we are not surprised to see this high on the list. In fact, the issue of spam calls is so prevalent in the UK, the government has started to take action . There are also consumer organizations such as Which? That are actively working to lower the amount of spam calls in the region. Egypt’s spam behavior is very similar to Kenya – where you can see a lot of scam calls going on. Judging by this graph, Egypt is the country that is receiving the most scam calls. Italy has a surprising amount of calls in the telemarketing category (53%). We can see that many of the top spammers are from television providers, potentially upselling subscriptions. The other type of telemarketing call is from energy companies. Over the past few months, Italy has faced rising prices of energy consumption, which could be the leading cause for energy company outreach to customers. This region has a large issue of scam (41%) and nuisance (38%) calls. Our research shows many names in combination with businesses, which help lead us to believe that scams are more prevalent in Bangladesh. The data in this article was aggregated anonymously from incoming calls that either has been marked as spam by users – or automatically been flagged by Truecaller during the period of January 1st, 2017 to May 31st, 2017 to understand the monthly average spam rate. During this period of time, our users received over 5.5 billion spam calls. As for what type of spam calls users are receiving the most we looked at the top 100 spammers in each region for the month of May. Nuisance: Due to this being a broad spectrum of calls, it is generally calls that is unwanted, disturbance for users, harassment, pranks. Telemarketing: Promotional calls from companies, surveys, political/robo calls, new client outreach for services, subscriptions, etc. Operator: Telecom companies upselling data plans, promotions, etc. Financial service: Banks, credit unions, credit card companies etc. Scam: Fraud attempts, money swindling, unknown links, etc. Insurance: Companies that specialize in selling different types of insurances. Debt collection: Organizations that specialize in payments of debts owed by individuals or businesses, bounty hunters. Political: Campaign calls to secure votes for parties, robocalls.